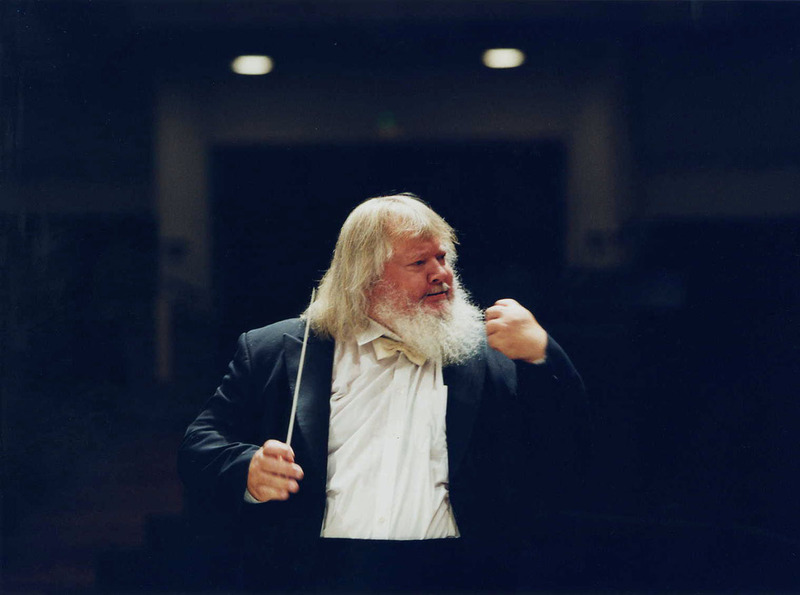 Leif Segerstam is a multitalented musician who has developed full careers in both conducting and composing. He has developed his own style of composing that he calls "free-pulsative", where the precise temporal relations between the parts of the musicians involved are not exactly determined. Segerstam is known as an incredibly prolific composer who may be inspired to write a dozen symphonies a year - there are already several hundred of them! "Segerstam does not so much create independent works as strands from the same musical flow of consciousness," notes Mikko Heiniö. 1 "Moment" and...7 "ZWEIXNOJAYESLICKGGLES & ZWEIXNOJAYESTUMBLES"
90, 1919, Japani... Tokio... SUO-MI... HEL-SINK-I...! Concerto for flute & orch. "Songs of Unicorns in a Horde of friendly Horns..."
String Quartet No. 30 "IKU-NOITUUKSIA"
Symphony No. 131 "Some more summery summaries..."
Symphony No. 144 "AIHMÉ (a Wonder!) BORN TO-DIE... I feel VIEL! (Japanese-German...) 1, 4, 4!..." Symphony No. 159 "Sharing Visions with Visitors..."
Symphony No. 299 with 1-12 Cello Obligat Soli... LAMENT !!!! Symphony No 55 "Augustic Notations..."
Symphony No 58 "Easteric thoughts..."
Symphony No 59 "In a Baggage to Japan..."
Symphony No 60 "Before 70..."
Symphony No 62 "Thinking of and Surfing on Some Numbers..."
Symphony No 63 "SING-A-PÅ-RE, SING, apor:EEE"
Symphony No 64 "Sunday Morning...before&after..."
Symphony No 65 "Botnic Thoughts..."
Symphony No 67 "After the 21252nd Day..."
Symphony No 68 "Nameless, Just Numbered..."
Symphony No 69 "Surfing & Clicking & ..."
Symphony No 70 "Before 80..."
Symphony No 71 "After 70..."
Symphony No 73 "1 after 72..."
Symphony No 74 "2nd after 72..."
Symphony No 75 "3rd after 72..."
Symphony No 76 "4th after 72..."
Symphony No 80 "Before Ninety..."
Symphony No 82 "At the end of another year..."
Symphony No 83 "From Autumn again to Spring again..."
Symphony No 84 "FOR A MILESTONE..."
Symphony No 87 "The Erected Infinity&is-a(=e)-friend?-ven(=vän)...?" Symphony No 89 "One before Ninety..."
Symphony No 90 "Because - because... = Six-ty..."
Symphony No 91 "Nostalgic Number..."
Symphony No 92 "Formula 4..."
Symphony No 93 "Meeting Point..."
Symphony No 94 "Starting Point..."
Symphony No 95 "Working hard..."
Symphony No 96 "Making life..."
Violin Concerto No. 12,222 "Launching Thoughts into Nexties..."